In this week's Film Room, we take a look at the story behind North Texas pulling off the trick play of the year—and why the game officials knew it was coming. Welcome to the Film Room. First, learn the ground rules about this place: No eating, drinking, talking or sleeping. And no cell phones. This is a weekly analysis of one big play, series, scheme or idea from the weekend’s slew of college games and deciphering what it means going forward. The meeting with the game officials was awkward, but North Texas special teams coordinator Marty Biagi needed to do two things: 1) make sure his now-famous trick play idea was completely legal and 2) prevent an inadvertent whistle from ruining the whole thing. And it worked. Midway through the first quarter, Keegan Brewer’s nonchalant reaction to receiving a punt duped the Razorbacks into thinking he waved for a fair catch, and he then ran 90 yards for a touchdown in an eventual 44–17 victory, one of the more thorough whippings you’ll see a Conference USA team put on a SEC squad. The play went viral. In an interview Sunday afternoon, Biagi estimates that he’s received 70 text messages and hundreds of notifications on Twitter. Brewer’s phone has been “jammed,” he says, with videos sent to him of the trick play that Biagi created back in May. The coach kept it secret from the entire team until a day before the actual game, and it all unfolded successfully on his 33rd birthday. The other star of the play came a long way to scoring one of the coolest touchdowns of 2018 himself: Brewer, who is listed at 5’ 11”, 180 pounds, did not have a Division I scholarship offer out of high school and quit football 18 months ago to pursue a career in firefighting. “Isn’t God amazing?” Biagi says. Biagi dubbed the play "Peter Pan," a reference to the universal cry that teams use to alert punt return members to stay clear of a kick, “Peter! Peter! Peter!” Biagi introduced Peter Pan to Brewer during a weight-lifting session over the summer, showing him YouTube clips of former North Carolina return man Ryan Switzer, who carried out similar concepts twice, once in 2015 and another in 2016, but neither went for scores. The duo kept it a secret until fall camp, when Biagi slowly began to reveal it to other players—first, to the other returners, next to the members of the return team, then to starting quarterback Mason Fine on Thursday night and finally to the entire team in a meeting Friday. There were laughs. Brewer’s safety was a bigger concern than him getting tackled. In fact, during his meeting with the game officials, they told him, Coach, you’re going to get this guy killed. Brewer took the risk without a second thought. After all, this kid isn’t your normal college football player. 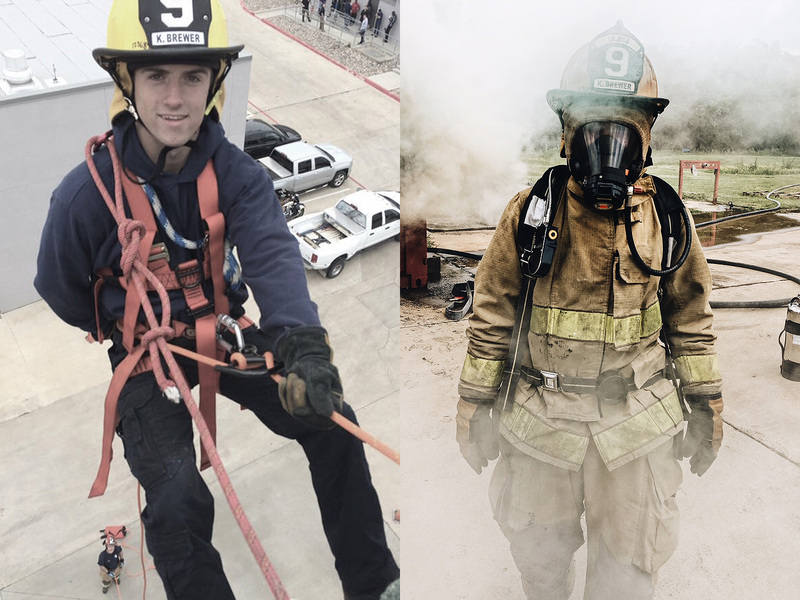 He made it through firefighter certification school last spring, enduring miles-long runs with heavy air packs strapped to his back, running blindfolded through smoke-filled quarters while maneuvering around hot flames. What’s a trick punt return compared to all of that? Brewer made sure to have good ball security in case Arkansas players didn’t fall for the trick and rammed into him. He admits to being anxious enough over the last few weeks to break his silence to a few teammates. “I told my parents a little bit, too, but [Biagi] was like, ‘Don’t speak about it to anybody.’ I told my dad, ‘We got a trick play’ and that’s all." Brewer wasn’t the only one acting on the play. Other members of the punt return team were instructed to block Arkansas players just enough. Biagi wanted them to work their way completely down the field, clearing out space for the speedy Brewer. Razorbacks linebacker Grant Morgan and defensive back Nate Dalton reached Biagi just as he caught the punt and then moved past him toward the Arkansas sideline, but not before one of them asked Brewer why the whistle had not been blown. And then there went Brewer, ignoring the question and blowing by the Arkansas player, right down the North Texas sideline behind a wall of blockers that Biagi designed. There was one more thing Biagi did in leading up to the kick: Three different times in the first quarter, he reminded the officials of his plan. The result was a confidence-boosting score for a team that eventually pounded Chad Morris’s Razorbacks to capture the nation’s attention. So, are the Mean Green (3–0) for real? They’ve outscored their opponents 148–56 thanks to an offense that’s averaging 504 yards a game, a defense that’s allowed a combined three touchdowns in the first half of its three games and a special teams unit that, well, you know the rest.